As previously discussed in Section 2.4.1, the distinction between nouns and verbs common to most languages is rather blurred in Ithkuil. All lexical stems in Ithkuil function equally as nouns or verbs and share many of the same morpho-semantic features and categories. This is because Ithkuil morpho-semantics does not see nouns and verbs as being cognitively distinct from one another, but rather as complementary manifestations of ideas existing in a common underlying semantic continuum whose components are space and time. The equivalents to nouns and verbs in other languages are merely “reified” (or nominalized) and “activized” (or verbalized) derivatives of semantic formatives. Nevertheless, for simplicity’s sake, we will refer to nominal formatives as nouns and verbal formatives as verbs when discussing their morphology. 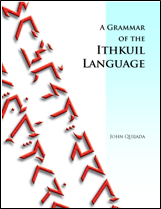 All Ithkuil formatives, whether functioning as nouns or verbs, inflect for nine Configurations, four Affiliations, four Perspectives, six Extensions, two Essences, four Contexts, and two Designations, and can take any of approximately 1800 optional suffixes. These morphological categories are explained in the sections which follow. To understand the Ithkuil concept of enumeration and quantification of nouns (i.e., what other languages term singular, plural, etc.) one must analyze three separate but related grammatical categories termed Configuration, Affiliation, and Perspective. These concepts are alien to other languages. While they deal with semantic distinctions which are quantitative in nature, these distinctions are usually made at the lexical level (i.e., via word choice) in other languages, not at the morphological as in Ithkuil. In this section we will deal first with Configuration, followed by Affiliation in Section 3.2 and Perspective in Section 3.3. 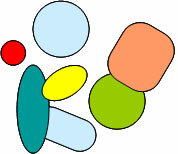 Specifically, Configuration deals with the physical similarity or relationship between members of a noun referent within groups, collections, sets, assortments, arrangements, or contextual gestalts, as delineated by internal composition, separability, compartmentalization, physical similarity or componential structure. This is best explained and illustrated by means of analogies to certain English sets of words. As another example, we can examine the English word ‘person.’ While persons may occur in simple numerical groupings such as ‘a (single) person’ or ‘three persons’ it is more common to find persons (i.e., people) referred to by words which indicate various groupings such as ‘group,’ ‘gathering,’ ‘crowd,’ etc. Segmentation and amalgamated componential structure are further configurative principles which distinguish related words in English. The relationships between car versus convoy, hanger versus rack, chess piece versus chess set, sentry versus blockade, piece of paper versus sheaf, girder versus (structural) framework, and coin versus roll of coins all exemplify these principles. Another type of contextual grouping of nouns occurs in binary sets, particularly in regard to body parts. These binary sets can comprise two identical referents as in a pair of eyes, however they are more often opposed or “mirror-image” (i.e., complementary) sets as in limbs, ears, hands, wings, etc. Ithkuil words indicate Configuration via a synthetic consonantal affix immediately following the C+V stem which also indicates the Affiliation, Perspective, Extension and Essence of the stem. This is the Ca affix discussed in Section 2.1.1. The actual values of these Ca affixes are shown later in Table 5 in Section 3.5.3 below, following the explanation of Essence. The nine configurations are the UNIPLEX, DUPLEX, DISCRETE, AGGREGATIVE, SEGMENTATIVE, COMPONENTIAL, COHERENT, COMPOSITE, and MULTIFORM. The function and morphology of these categories are explained below along with examples of the various configurations applied to four different stems: aph-, eq-, el-, and upšá-. For the set of affixes which mark this configuration, see Table 5 in Section 3.5.3 below. The DUPLEX configuration indicates a related binary set. While it often refers to body parts, e.g., one’s eyes, ears, lungs, wings, etc., it can also be used to describe any set of two identical or complementary objects or entities, e.g., a matched pair of vases, a two-volume set, a set of bookends, mutual opponents. Thus, the Ithkuil word for spouse inflected for the DUPLEX configuration would translate as a man and wife or a married couple. The DISCRETE configuration indicates a grouping or set of the basic stem units that are more or less identiform (each having the same design or physical appearance). This grouping or set-nature can be either spatial, as in a flock of gulls (flying together), or temporal (i.e., sequentially repetitive or iterative) as in (a flock of) gulls flying one after another. Further examples of English nouns or noun phrases which would be translated using the DISCRETE are a grove, a set of screwdrivers, a group of soldiers, a pile of leaves, a bowl of grapes, a series of hammer blows, an area of holes. Thus, the Ithkuil word for (identical) set would simply be the word for thing or object inflected for the DISCRETE configuration. 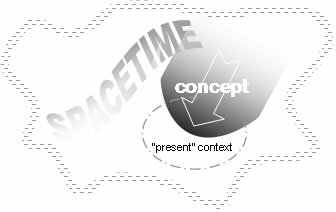 Note that the distinction between a spatially configured set versus a temporally (i.e., iterative) configured set would be made by use of either the DPR suffix, -šk, or the SEP suffix, -mb specifying which spacetime axis is implied. These suffixes are analyzed in Sec. 7.4.13. For verbs, the DISCRETE signifies a single set of repetitions, whether spatially or temporally, viewed as a single holistic event. The individual member components acts, states, or events within this set can be either UNIPLEX, e.g., to take steps, to flip through pages, to have spots, to dig holes in an area, or DUPLEX in nature, e.g., to hammer, to spin, to breathe. 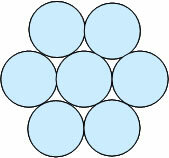 The SEGMENTATIVE configuration indicates a grouping or set of the basic stem units, the individual members of which are physically similar or identical and are either in physical contact with one another, physically connected via some linking medium, or in sufficiently close contact with one another so that the group moves or operates together. Examples would be a web, a train of flatcars, a convoy of schoolbuses, a string of pearls, a fall of leaves, a line of dancers, a parade of Barbie dolls (e.g., coming off an assembly line). To illustrate the difference between this configuration and the DISCRETE above, we saw that the word grape in the DISCRETE would be translated as a serving of grapes, while in the SEGMENTATIVE it would mean a bunch of grapes (i.e., still connected to each other on a portion of vine). 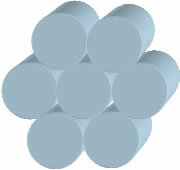 The COHERENT configuration functions similarly to the SEGMENTATIVE above, except that the individual members of the configuration are connected, fused or mixed with one another to form a coherent emergent entity, i.e., the total configuration of objects constitutes an entirely new gestalt-like entity. Examples of English words which would be translated using the COHERENT are a bookcase, a phalanx, a xylophone. 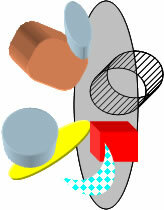 The MULTIFORM configuration is the most difficult to explain, as there is no Western linguistic equivalent. The MULTIFORM serves to identify the noun as an individual member of a “fuzzy” set. A fuzzy set is a term which originates in non-traditional logic, describing a set whose individual members do not all share the same set-defining attributes to the same degree, i.e., while there may be one or more archetypical members of the set which display the defining attributes of the set exclusively and exactly, other members of the set may vary from this archetypical norm by a wide range of degrees, whether in physical resemblance, degree of cohesion or both. Indeed, some members of the set may display very little resemblance to the archetype and be closer to the archetype of a different fuzzy set, i.e., fuzzy sets allow for the idea of “gradient overlap” between members of differing sets. It is difficult to accurately translate into English without resorting to paraphrase the sorts of concepts that Ithkuil easily expresses using the MULTIFORM. For example, the Ithkuil word for ‘tree’ inflected for the MULTIFORM configuration would mean something like a group of what appear to be trees, or better yet, a group of tree-like objects (i.e., some being trees, and others seeming less like trees). Essentially, any set of entities whose similarity of membership varies by different degrees in comparison to an archetypical member of the set can be expressed using the MULTIFORM. For examples, the Ithkuil word for library would simply be a word meaning something like work (i.e. thing authored/composed) inflected for the MULTIFORM, signifying a hodge-podge assortment of writings and compositions (e.g., including books, pamphlets, notebooks, ledgers, formulas, letters, journals, recordings, magazines, etc.). Other example concepts translatable using the MULTIFORM would be a rag-tag group of people, an incoherent pattern, lives in flux. While the category of Configuration from the preceding section distinguishes the relationships between the individual members of a set in terms of physical characteristics, physical attributes or physical connections, the category of Affiliation operates similarly to distinguish the member relationships in terms of subjective purpose, function, or benefit. Affiliation operates synergistically in conjunction with Configuration to describe the total contextual relationship between the members of a set. Like Configuration, the meanings of nouns or verbs in the various affiliations often involve lexical changes when translated into English. Returning to our earlier example of the word tree, we saw how a group of trees of the same species becomes a grove in the DISCRETE configuration. The word grove implies that the trees have grown naturally, with no specific purpose or function in regard to human design or utilization. On the other hand, groves of trees may be planted by design, in which case they become an orchard. We saw how trees occurring as a natural assortment of different kinds is termed a forest. However, such assortments can become wholly chaotic, displaying patternless disarray from the standpoint of subjective human design, thus becoming a jungle. As another example, we saw how the word person becomes group, or gathering, both of which are neutral as to subjective purpose or function. However, applying a sense of purposeful design generates words such as team, while the absence of purpose results in crowd. There are four affiliations: CONSOLIDATIVE, ASSOCIATIVE, VARIATIVE, and COALESCENT. Affiliation is indicated as part of the Ca affix as explained in Section 3.1 above and in Section 2.1.1. The actual values of these Ca affixes are shown later in Table 5 in Section 3.5.3 below, following the explanation of Extension. The details of the four affiliations are explained below. The CONSOLIDATIVE affiliation indicates that the individual members of a configurational set are a naturally occurring set where the function, state, purpose or benefit of individual members is inapplicable, irrelevant, or if applicable, is shared. It differs from the ASSOCIATIVE affiliation below in that the role of individual set members is not subjectively defined by human design. Examples are tree branches, a grove, a mound of rocks, some people, the clouds. The CONSOLIDATIVE is also the affiliation normally applied to nouns in the UNIPLEX configuration when spoken of in a neutral way, since a noun in the UNIPLEX specifies one single entity without reference to a set, therefore the concept of “shared” function would be inapplicable. Examples: a man, a door, a sensation of heat, a leaf. With verbs, the CONSOLIDATIVE would imply that the act, state, or event is occurring naturally, or is neutral as to purpose or design. For the set of affixes which mark this affiliation, see Table 5 in Section 3.5.3 below. The ASSOCIATIVE affiliation indicates that the individual members of a configurational set share the same subjective function, state, purpose or benefit. Its use can be illustrated by taking the Ithkuil word for soldier in the DISCRETE configuration and comparing its English translations when inflected for the CONSOLIDATIVE affiliation (= a group of soldiers) versus the ASSOCIATIVE (= a troop, a platoon). It is this CONSOLIDATIVE versus ASSOCIATIVE distinction, then, that would distinguish otherwise equivalent DISCRETE inflections of the Ithkuil word for tree by translating them respectively as a grove versus an orchard. The ASSOCIATIVE affiliation can also be used with nouns in the UNIPLEX configuration to signify a sense of unity amongst one’s characteristics, purposes, thoughts, etc. For example, the word person inflected for the UNIPLEX and ASSOCIATIVE would translate as a single-minded person. Even nouns such as rock, tree or work of art could be inflected this way, subjectively translatable as a well-formed rock, a tree with integrity, a “balanced” work of art. With verbs, the ASSOCIATIVE signifies that the act, state or event is by design or with specific purpose. The CONSOLIDATIVE versus ASSOCIATIVE distinction could be used, for example, with the verb turn in I turned toward the window to indicate whether it was for no particular reason or due to a desire to look outside. The VARIATIVE affiliation indicates that the individual members of a configurational set differ as to subjective function, state, purpose or benefit. The differences among members can be to varying degrees (i.e., constituting a fuzzy set in regard to function, purpose, etc.) or at complete odds with one another, although it should be noted that the VARIATIVE would not be used to signify opposed but complementary differences among set members (see the COALESCENT affiliation below). It would thus be used to signify a jumble of tools, odds-and-ends, a random gathering, a rag-tag group, a dysfunctional couple, a cacophony of notes, of a mess of books, a collection in disarray. It operates with nouns in the UNIPLEX to render meanings such as a man at odds with himself, an ill-formed rock, a chaotic piece of art, a “lefthand-righthand” situation. With verbs, the VARIATIVE indicates an act, state, or event that occurs for more than one reason or purpose, and that those reasons or purposes are more or less unrelated. This sense can probably be captured in English only through paraphrase, as in She bought the house for various reasons or My being at the party served several purposes. With non-UNIPLEX configurations, the use of the VARIATIVE affiliation can describe rather complex phenomena; for example, a sentence using the SEGMENTATIVE configuration such as The light is blinking in conjunction with the VARIATIVE would mean that each blink of the light signals something different than the preceding or following blinks. The COALESCENT affiliation indicates that the members of a configurational set share in a complementary relationship with respect to their individual functions, states, purposes, benefits, etc. This means that, while each member’s function is distinct from those of other members, each serves in furtherance of some greater unified role. For example, the Ithkuil word translating English toolset would be the word for tool in the AGGREGATIVE configuration (due to each tool’s distinct physical appearance) and the COALESCENT affiliation to indicate that each tool has a distinct but complementary function in furtherance of enabling construction or repair activities. Another example would be the Ithkuil word for finger inflected for the SEGMENTATIVE configuration and the COALESCENT affiliation, translatable as the fingers on one’s hand (note the use of the SEGMENTATIVE to imply the physical connection between each finger via the hand). A further example would be using the COALESCENT with the word for (piece of) food to signify a well-balanced meal. The COALESCENT naturally appears most often in conjunction with the DUPLEX configuration since binary sets tend to be complementary. It is used, for example, to signify symmetrical binary sets such as body parts, generally indicating a lefthand/righthand mirror-image distinction, e.g., one’s ears, one’s hands, a pair of wings. Pairs that do not normally distinguish such a complementary distinction (e.g., one’s eyes) can nevertheless be optionally placed in the COALESCENT affiliation to emphasize bilateral symmetry (e.g., one’s left and right eye functioning together). With verbs, the COALESCENT signifies that related, synergistic nature of the component acts, states, and events which make up a greater holistic act, state, or event. It imposes a situational structure onto an act, state, or event, where individual circumstances work together in complementary fashion to comprise the total situation. It would be used, for example, to distinguish the sentences He traveled in the Yukon from He ventured in the Yukon, or I came up with a plan versus I fashioned a plan. Perspective is the closest Ithkuil morphological category to the Number and Tense categories of other languages (e.g., singular/plural and past/present/future). However, the correspondence is only approximate because Perspective does not specifically address the quantity to which a formative is instantiated within a given context, nor when it occurs relative to the present, but rather the manner in which it is spatio-temporally instantiated. 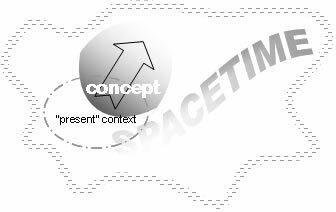 Specifically, Perspective indicates whether a noun or verb is to be identified as 1) a “bounded” contextual entity (i.e., having a spatio-temporally unified or accessible manifestation), 2) an unbounded entity (i.e., manifested as spatio-temporally separated or inaccessible), 3) as a unified collective or generic entity throughout spacetime, or 4) as a spatio-temporally neutral abstraction. How this works requires separate explanations for nouns and verbs. Perspective with Nouns. 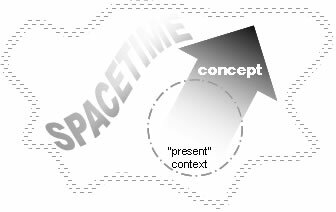 What Perspective means for nouns is that, in addition to merely indicating whether a given spatial context contains one or more than one, it also specifies single versus multiple manifestations in time, as well as along an axis of concreteness versus abstraction. Complicating the picture is the fact that the categories of Configuration and Affiliation (see Sections 3.1 and 3.2 above) already contain an implicit numerical element due to the fact that they usually describe multi-membered sets. It is for all these reasons that the terms “singular” and “plural” have been avoided. Perspective with Verbs. 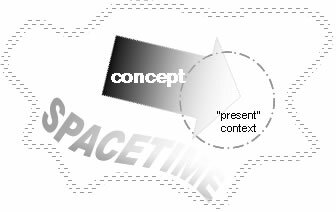 For verbs, the aspect of “boundedness” inherent in Perspective does not imply a quantitative context but rather an aspect of spatio-temporal “accessibility,” i.e., whether or not an act, state, or event can be viewed as a unified whole within the present temporal context. This is a long way from the “tense” categories of Western languages. In Ithkuil, the notion of linearly progressive time is not inherently expressed in the verb (although it can be specified, if necessary, using various aspectual markers - see Section 5.10). There are four perspectives in Ithkuil: MONADIC, UNBOUNDED, NOMIC, and ABSTRACT. These are indicated as part of the Ca affix as explained in Sec. 3.1 above. The actual values of these Ca affixes are shown later in Table 5 in Section 3.5.3 below, following the explanation of the category of Essence. Each perspective’s specific meaning and usage is explained and illustrated below. The MONADIC signifies a bounded embodiment of a particular configuration. By “bounded embodiment” is meant a contextual entity which, though possibly numerous in membership or multifaceted in structure, or spread out through a time duration, is nevertheless being contextually viewed and considered as a “monad,” a single, unified whole perceived to exist within a literal or figurative psychologically uninterrupted boundary. This is important, since configurations other than the UNIPLEX technically imply more than one discrete entity/instance being present or taking place. For nouns, this boundary is physically contiguous, like a container, corresponding to the “surface” of an object (whether literal or psychological). For verbs, this boundary is psychologically temporal, specifically the “present” (which in Ithkuil might be better thought of as the “context at hand” or the “immediately accessible context”). This distinction as to how “bounded embodiment” is interpreted for nouns and verbs is appropriate, given that Ithkuil considers nouns as spatially reified concepts while considering verbs to be their temporally “activized” counterparts (see Section 2.4.1). Thus, using the word tree for example, while there might be many trees present in terms of number, the MONADIC implies they form only one embodiment of whatever particular Configuration category is manifested. Using the AGGREGATIVE configuration as an example, the MONADIC would mean there is only one AGGREGATIVE set of trees, i.e., one forest. Note that, even more so than with the MONADIC, translation of the UNBOUNDED into Western languages is subjective, as the translation must necessarily convey linear tense information which is not conveyed by the Ithkuil original. The NOMIC refers to a generic collective entity or archetype, containing all members or instantiations of a configurative set throughout space and time (or within a specified spatio-temporal context). Since it is all members being spoken of, and no individual members in particular, this category is mutually exclusive from the MONADIC or UNBOUNDED. For nouns, the NOMIC corresponds approximately to the several constructions used for referring to collective nouns in English, as seen in the sentences The dog is a noble beast, Clowns are what children love most, There is nothing like a tree. With verbs, the NOMIC designates an action, event, or situation which describes a general law of nature or a persistently true condition or situation spoken of in general, without reference to a specific instance or occurrence of the activity (it is, in fact, all possible instances or occurrences that are being referred to). English has no specialized way of expressing such generic statements, generally using the simple present tense. Examples of usage would be The sun doesn't set on our planet, Mr. Okotele is sickly, In winter it snows a lot, That girl sings well. Similar to the formation of English abstract nouns using suffixes such as -hood or -ness, the ABSTRACT transforms a configurative category into an abstract concept considered in a non-spatial, timeless, numberless context. While only certain nouns in English can be made into abstracts via suffixes, all Ithkuil nouns in all Configurative categories can be made into abstracts, the translations of which must often be periphrastic in nature, e.g., grove → the idea of being a grove or “grovehood”; book → everything about books, having to do with books, involvement with books. With verbs, the ABSTRACT is used in verbal constructions to create a temporal abstraction, where the temporal relationship of the action, event, or state to the present is irrelevant or inapplicable, similar to the way in which the English infinitive or gerund form (used as substitutes for a verb phrase) do not convey a specific tense in the following sentences: Singing is not his strong suit; It makes no sense to worry about it; I can't stand her pouting. As a result, the ABSTRACT acts as a “timeless” verb form which, much like these English infinitives and gerunds, operates in conjunction with a separate main verb in one of the other three perspectives. The ABSTRACT is often used in conjunction with certain modalities and moods of the verb (see Sec. 6.1 on Modality and Section 5.2 on Mood) which convey hypothetical or unrealized situations, in which the temporal relationship to the present is arbitrary, inapplicable, or unknowable. Extension is another Ithkuil morphological category for which there is no exact equivalent in other languages. It applies to all formatives and indicates the manner in which the noun or verb is being considered in terms of spatial or temporal extent or boundaries. There are six extensions: DELIMITIVE, PROXIMAL, INCEPTIVE, TERMINATIVE, DEPLETIVE, and GRADUATIVE. Extension is shown as part of a formative’s Ca affix which also indicates Configuration, Affiliation, Perspective and Essence. The values of this affix are shown in Sec. 3.5.3. Alternately, extension can be shown via tone-marking of an adjacent verbal adjunct, explained in Section 6.3.5. The DELIMITIVE extension indicates that a noun is being spoken of in its contextual entirety as a discrete entity with clear spatio-temporal boundaries, with no emphasis on any particular portion, edge, boundary, limit, or manifestation beyond the context at hand. It can be considered the neutral or default view, e.g., a tree, a grove, a set of books, an army. To illustrate a contextual example, the English sentence He climbed the ladder would be translated with the word ladder in the DELIMITIVE to show it is being considered as a whole. With verbs, this extension indicates that the act, state, or event is being considered in its entirety, from beginning to end, e.g., She diets every winter (i.e., she starts and finishes each diet). The DELIMITIVE can be thought of as an expanse of spacetime that has definite beginning and ending points, beyond which the noun or verb does not exist or occur. 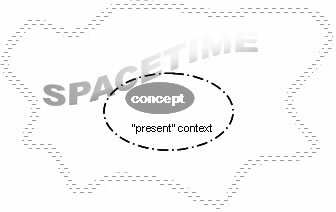 The graphic to the right illustrates the spatio-temporal relationship of a concept in the DELIMITIVE to the context at-hand (i.e., the spatio-temporal “present”). The PROXIMAL extension indicates that a noun is being spoken of not in its entirety, but rather only in terms of the portion, duration, subset, or aspect which is relevant to the context at hand. It would be used to translate the words tree, journey, and ladder in the sentences That tree is hard there (e.g., in the spot where I hit against it), She lost weight during her journey, or He climbed on the ladder (i.e., it is not relevant to the context to know if he made it all the way to the top). Note that in these sentences, the PROXIMAL does not refer to a specific or delineated piece, part, or component of the tree or ladder, but rather to the fact that delineated boundaries such as the ends of the ladder or the entirety of the tree are not relevant or applicable to the context at hand. With verbs, this extension signifies that it is not the entirety of an act, state, or event which is being considered, but rather the spatial extent or durational period of the act, state, or event relevant to the context, e.g., She’s on a diet every winter (i.e., focus on “having to live on” a diet, not the total time spent dieting from start to finish). 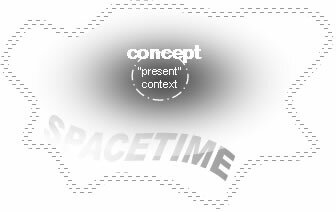 The graphic to the right illustrates the spatio-temporal relationship of a noun or verbal concept in the PROXIMAL to the context at-hand (i.e., the spatio-temporal “present”). The INCEPTIVE extension focuses on the closest boundary, the beginning, initiation, or the immediately accessible portion of a noun or verb, without focusing on the boundaries of the remainder. It would be used in translating the nouns tunnel, song, desert, daybreak and plan in the following sentences: We looked into (the mouth of) the tunnel, He recognizes that song (i.e., from the first few notes), They came upon (an expanse of) desert, Let’s wait for daybreak, I’m working out a plan (i.e., that I just thought of). In verbal contexts it would correspond to the English ‘to begin (to)…’ or ‘to start (to)…’ as in He began reading, It’s starting to molt, or She goes on a diet every winter. The TERMINATIVE extension focuses on the end, termination, last portion, or trailing boundary of a noun, without focusing on the preceding or previously existing state of the noun. It would be used in translating the words water, story, and arrival in the sentences There’s no water (i.e., we ran out), I like the end of that story, and We await your arrival. With verbs, it is illustrated by the sentences It finished molting or She’s come off her diet. The DEPLETIVE extension focuses on the terminal boundary or “trailing” edge of a noun, where this terminus is ill-defined, “diffuse” or extended to some degree, (i.e. the at-hand context of the noun “peters out” or terminates gradually). Essentially, it applies to any context involving actual or figurative fading. It would be used in translating the words water, strength, and twilight in the sentences He drank the last of the water, I have little strength left, She disappeared into the twilight. With verbs, it is exemplified by the phrases to wind down, to fade out, to disappear gradually and similar notions, e.g., She’s eating less and less these days. The GRADUATIVE extension is the inverse of the DEPLETIVE, focusing on a diffuse, extended “fade-in” or gradual onset of a noun. It would be used in translating the words darkness, wonder, and music in the following sentences: Darkness came upon us, I felt a growing sense of wonder, The music was very soft at first. With verbs it is illustrated by verbs and phrases such as to fade in, to start gradually, to build up, and similar notions, e.g., She’s been eating more and more lately. 1a) The boy ran off to sea. 1b) The boy who ran off to sea didn’t run off to sea. 2a) The dog you saw is to be sold tomorrow. 2b) The dog you saw doesn’t exist. Sentences (1a) and (2a) appear to be straightforward sentences in terms of meaning and interpretation. However, at first blush, sentences (1b) and (2b) appear nonsensical, and it is not until we consider specialized contexts for these sentences that they make any sense. For example, (1b) would make sense if being spoken by an author reporting a change of mind about the plot for a story, while (2b) makes sense when spoken by a puzzled pet store owner in whose window you earlier saw a dog that is now no longer there. 3) You must come home at once. 4) That girl can sing better than anybody. 5) We should attack at dawn. Each of the above three sentences describe potential events, not actual real-world happenings that are occurring or have occurred. For example, in Sentence (3) no one has yet come home nor do we know whether coming home is even possible, in Sentence (4) the girl may never sing a single note ever again for all we know, and Sentence (5) gives us no information as to whether any attack will actually occur. The Ithkuil category of Essence explicitly distinguishes real-world actualities from their alternative, imagined or potential counterparts. The two essences are termed NORMAL and REPRESENTATIVE, the former being the default essence denoting real-world nouns and verbs, the latter denoting alternative counterparts. By marking such counterparts explicitly, Ithkuil allows a speaker to express any noun or verb as referring to a real-world versus alternative manifestation, without having the listener infer such from an explanatory context. Essence is as part of the Ca affix which also indicates Configuration, Affiliation and Perspective. The values of this affix are shown below in Sec. 3.5.3. Compare the following two sentences and their translations to see how placement of the REPRESENTATIVE essence on different formatives changes the meaning. In the example immediately above, no one is necessarily on the path (including the speaker), so steepness exists merely as an idea/assumption in the speaker’s mind. Tables 5(a) through 5(f) below indicate all the affix values of Ca, the synthetic affix which indicates which of the nine Configurations, four Affiliations, four Perspectives, and six Extensions are applied to a particular stem. Context is yet another morphological category with no equivalent in other languages. It indicates what tangible or intangible features or aspects of a formative are being psychologically implied in any given utterance. There is no way to show this in translation other than by paraphrase. There are four contexts: the EXISTENTIAL, the FUNCTIONAL, the REPRESENTATIONAL, and the AMALGAMATE, marked by a vocalic suffix Vf which also conveys verbal Format (the category of Format will be analyzed in Section 6.4). Table 6 below shows the values for this suffix. The four Contexts are explained below and illustrated via example Ithkuil translations of the English sentence The orchestra is playing. The EXISTENTIAL context focuses on those features of a noun or verb which are ontologically objective, i.e., those that exist irrespective of any observers, opinions, interpretations, beliefs or attitudes. Similarly excluded from consideration in the EXISTENTIAL is any notion of a noun’s use, function, role or benefit. The EXISTENTIAL serves only to point out the mere existence of a noun as a tangible, objective entity under discussion. It is thus used to offer mere identification of a noun or verb. For example, consider the sentence A cat ran past the doorway. If the Ithkuil words corresponding to cat, run, and doorway are in the EXISTENTIAL, then the sentence merely describes an objective scene. No implication is intended concerning the subjective nature of the two entities or the action involved. The sentence is merely stating that two entities currently have a certain dynamic spatial relationship to each other; those two entities happen to be a cat and a doorway, and the running merely conveys the nature of the spatial relationship. The FUNCTIONAL context focuses on those features of a formative that are defined socially by ideas, attitudes, beliefs, opinions, convention, cultural status, use, function, benefit, etc. It serves to identify not what a noun existentially is, but to show that the noun has specific (and subjective) contextual meaning, relevance or purpose. The REPRESENTATIONAL context focuses on a formative as a symbol, metaphor, or metonym*, in that it indicates that the formative is serving as a representation or substitute for some other concept or entity which is abstractly associated with it. For example, the metaphorical connotations of the English sentence That pinstripe-suited dog is checking out a kitty, can be equally conveyed in Ithkuil by inflecting the words for ‘dog and ‘kitty’ into the REPRESENTATIONAL context. The REPRESENTATIONAL is one of several ways that Ithkuil overtly renders all metaphorical, symbolic, or metonymic usages (from a grammatical standpoint). The AMALGAMATIVE context is the most abstract and difficult to understand from a Western linguistic perspective. It focuses on the systemic, holistic, gestalt-like, componential nature of a formative, implying that its objective and subjective totality is derived synergistically from (or as an emergent property of) the interrelationships between all of its parts, not just in terms of a static momentary appraisal, but in consideration of the entire developmental history of the noun and any interactions and relationships it has (whether past, present or potential) within the larger context of the world. Its use indicates the speaker is inviting the hearer to subjectively consider all the subjective wonder, emotional nuances, psychological ramifications and/or philosophical implications associated with the noun’s existence, purpose, or function, as being a world unto itself, intrinsically interconnected with the wider world beyond it on many levels. Thus the AMALGAMATIVE version of our sentence The cat ran past the doorway would take on quite melodramatic implications, with the cat being representative of everything about cats and all they stand for, the doorway as being representative of the nature of doorways as portals of change, thresholds of departure, and the juncture of past and the future, while the act of running becomes representative of flight from enemies, rapidity of movement, the body at maximum energy expenditure, etc. Designation is a somewhat subjective category, with no equivalent in Western languages. It refers to a two-fold distinction in a formative regarding its contextual status, authority, permanence, or extra-contextual relevance. The two Designations are the INFORMAL and the FORMAL, shown by the formative’s syllabic stress (in conjunction with the verbal category of Relation which will be discussed in Section 5.4). The two Designations are explained below. The INFORMAL designation is shown by either penultimate (second-to-last) or antepenultimate (third-from last) syllabic stress on the formative, depending on the formative’s Relation (see Section 5.4 on Relation). The INFORMAL designation indicates that the noun or verb in question does not exist in a necessarily permanent state, or is to be considered only for the duration of the context in which it is spoken, with any lasting effect, influence or permanency beyond the context being either absent, unknown or irrelevant. It is best illustrated by comparative examples with the FORMAL designation in the section immediately below. The FORMAL designation is shown by either ultimate (final) or pre-antepenultimate (fourth-from last) syllabic stress on the formative, depending on the formative’s Relation (see Section 5.4 on Relation). The FORMAL designation imparts a sense of permanency and/or authority, raising the noun or verb to a more definitive, formal or institutional manifestation of itself, or stressing this authoritative/definitive nature if the meaning already includes it. For example, stems translatable as ‘symbol,’ ‘eat,’ ‘thought,’ and ‘a model’ in the INFORMAL would become ‘icon,’ ‘dine,’ ‘idea,’ and ‘archetype’ in the FORMAL. The FORMAL achieves several subtle purposes from a lexico-semantic standpoint. While some Ithkuil words would translate the same in English no matter which designation (e.g., to hurt, to float, breath, to fall, shade, sleep, cough), many stems would have different translations in English depending on their designation. For example, the stem eq- with the affiliated meanings person → group → gathering → crowd → throng, etc. in the INFORMAL designation would change to the following series of approximate translations when placed in the FORMAL designation: official → team → association/congregation → assembly → masses, etc. As can be seen from the above list, the exact interpretation of Designation for each word-root is specific to each word-root, depending on its associated semantic context. In regard to the gender categories from other languages, Ithkuil has no distinctions of gender (e.g., masculine, feminine, neuter, etc.). There is no “agreement” or morpho-phonological concord of any kind between a noun and other words or morphological elements in a sentence, i.e., there is none of the required matching of masculine or feminine or singular/plural agreement between nouns, articles, and adjectives as found in most Western languages.